Good Stuff Becomes Great Stuff With the New GStuff Store! GStuff, the fast becoming famous Healthy Food and Lifestyle products store drew enthusiastic crowds during its soft at the Alabang Town Center Mall last February 14! Owned by Gina Lopez, the President and Heart of the ABS-CBN Foundation, GFStuff Store’s new location is at the 2nd level, near the Madrigal entrance, by the Activity Center and just beside a coffee shop.New products to be launched in the store are Mushroom Chicharon, Oil Pulling with Doterra Essential Oils, Rose’s Garlic Dressing, Ming’s Cookies along with the bestsellers like Anvil Kopi with Malunggay, Anvil Oil for Body Pains. Since its inception over two years ago, GStuff products have remained true to its three particular advocacies. First, carrying various healthy snacks from the famous Taro Chips to the Anvil Tsokolate Chocolate drinkthat taste so good, there also the famous toiletries from the MoringaShampoo and Conditioner to the massage oils and insect repellents whose scents enhance and even give any busy body and mind relaxations. These are lifestyle products that infuses wellness into, and even perpetuate a healthy lifestyle, they are good for the body. GStuff products are also really devoid of ingredients that adversely affect the environment. Therefore they were produced for and are used by consumers but do not harm the earth. Very importantly GStuff is community based because every product it sells root from the micro enterpreneurs; people with small thriving businesses whose products are brought and sold in mainstream Manila markets. This brings forth the philanthropic attitude and missions the brand remains true over. Thus GStuff’s famous slogans – Good for You, Good for the Environment, Good for Communities. 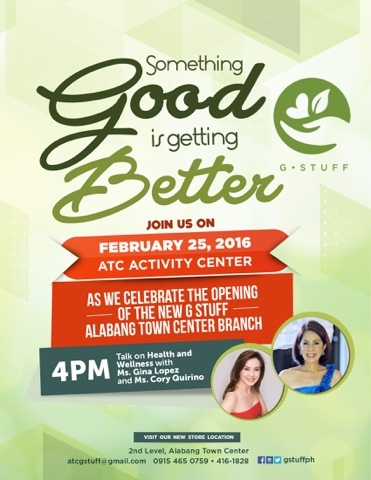 The mew GStuff at the 2nd level of the Alabang Town Center will have its Grand Opening on February 25, 2016, Thursday! President of the ABS-CBN Foundation Gina Lopez who owns GStuff and Health Living Advocate Cory Quirino will both be present! Everybody is invited!